Last year I wrote a post called Friends Are Hard to Find. I mentioned that believe it or not, I have a little difficulty in finding people who have any desire to hang out with me. When I wrote it, I was talking about myself, but suddenly my inbox and comments section blew up with "Me too!" It got me thinking. There were a lot of us who were feeling the same way. Wouldn't it be cool if we could get together and have a laugh? I decided to invent PIWTPITT's Friends Night. I figured if nothing else it would get some ladies out of the house and they could talk about how funny/insensitive/annoying/adorable/foul-mouthed/stupid I am. Many, many women across the country stepped up and agreed to take charge of their local Friends Night. I planned the one for Kansas City, but I wasn't going to go. It was a terrifying thought. Plus, I'd have to shower and find clean clothes to wear. That's a lot of work for strangers and I'd just downloaded a new book to my Kindle. I was busy, y'know? And then the Hubs said, "Of course you're going. This is your idea. You're the one complaining you want a friend. All of these women are going because they feel the same way you do and now you're going to stay home and read all night?" He brushed my hair and told me I was pretty and sent me on my way. He was right. I had fun. It was exactly what I needed. I needed to laugh and talk and just let loose. This summer I started hearing from women who missed last year's night. "When are you planning one for this year, Jen?" and "I'd love to go if you have one in my town, Jen." I was reading some of these emails in my "office" (AKA the bathroom) while my children pounded on the door demanding food and help with homework. It was like Divine Intervention. I realized what I needed to do. Sure, I could use a few more friends, but what I really want now is to PEE ALONE. 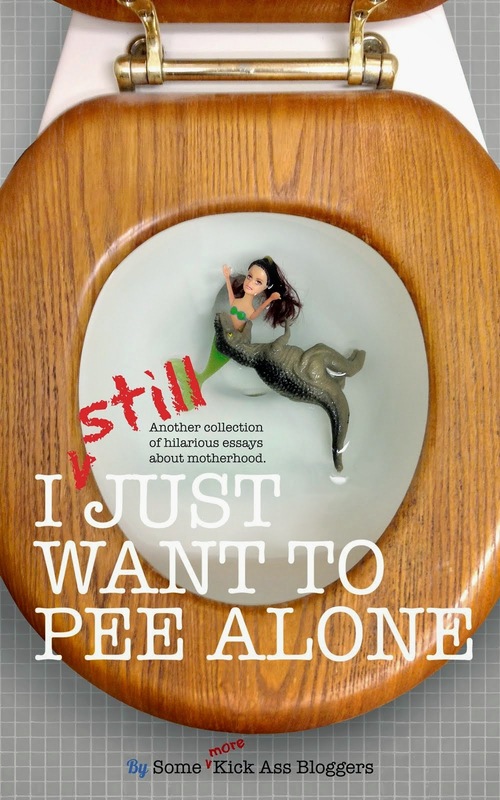 I don't know if you're aware or not, but this spring I put together an anthology called I Just Want to Pee Alone. I pulled together 36 women from across the country to write some of the most hilarious stories about motherhood you'll ever read. The book quickly became a best seller. It resonated with moms everywhere. Any woman who reads that book can find at least one story that speaks to her. I didn't know many of the contributors when I asked them to join me in the book, but over the past several months, we have formed a community together. It showed me that women need a place where they can go to escape the day to day drudgery. We all need that. It doesn't matter if you're a mother or not - I've seen those pictures of pets pawing under your bathroom door. So, I am declaring a new holiday. I Just Want to Pee Alone Day!!! Mark your calendars, ladies, because October 16th is a day for you. This isn't like Mother's Day where you still have to go and see your own mother or do the dishes after your husband "cooks" for you or wear a lovely hand-crafted macaroni necklace all day. Nope. This day is all about doing what you want to do - guilt free! 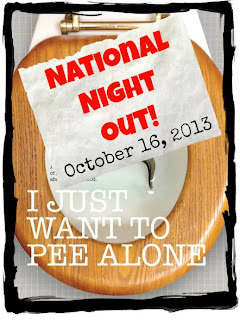 To celebrate the First Annual I Just Want to Pee Alone Day (hereby called FAIJWTPAD) several of the contributors to the anthology and other blogger friends have come together to host National Ladies' Night Out (AKA #Peealonenight) in a city near you and they're inviting you to join them. THERE ARE LOTS MORE NOW. CHECK HERE TO SEE THE COMPLETE LIST. I know the idea can sound a bit daunting, but I can guarantee you that it will be worth the effort it takes to leave the house. If the thought of going alone sounds awful, then bring your sister, your neighbor, your co-worker, or even your mom (you owe her a night to pee alone). 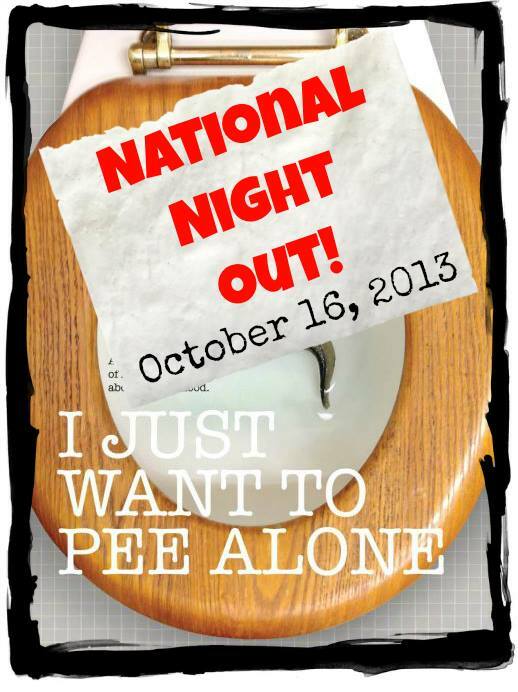 You can find all of the events listed above and more here: in the Events section on the I Just Want to Pee Alone Facebook page. We're adding more all the time, so keep checking in and be sure to RSVP so we know who is coming. If there isn't one planned for a city near you, don't fret, because YOU can host. You don't have to be a blogger to host, it was just easier to ask my bloggy friends at first, because they looooove this sort of stuff. It isn't hard. Just pick a location near you and a time on October 16th that works for you. It doesn't need to be fancy. Something casual tends to work best anyway. Once you've got the details figured out, send me an email at sweetsadiecreations@gmail.com and I will add your event to the page. Look for a location near you and keep watching for new ones to be added. We hope to see you there! I look at my backyard. All the kids are on the sport court or grass. The pool cover is pulled tight over the pool, completely obscuring the water — and the pool itself is surrounded by a 5-foot-tall locked iron fence. Oh, but I do know. That’s why I locked the pool fence, ensured the pool cover completely encased the pool, and invited all the kids’ parents so they could enjoy lunch out on the patio while simultaneously keeping an eye on their kids. Also, the kids aren’t 4. They’re in 4th grade. But I calmly reassure the mom, Karen, that no one will be admitted to the pool. I’ve just met her today – and I’m committed to making friends with all the parents of the kids at Tucker’s new school. It’s why I invited the moms to attend the party in the first place. Karen seems slightly mollified by my assurance and wanders off. I greet some more parents, stack the birthday gifts, and snap a few photos of Tucker having a blast with the kids from his class. I look over to see a few kids riding around on the sport court. “But you don’t have enough helmets for all the kids, do you?” she asks. “Oh, it’s just a flat sport court; they’re not going very fast. We’re in the backyard, so we’re not near the street at all. I think it’ll be OK.” I find myself feeling a bit defensive. I check out the kids – will they be OK? They’re 9 and 10 years old – they look pretty hale and hearty – I think they’ll be OK, right? Right? This chick is messing with my head. Chloe calls me over to refill the chip bowl. She’s so excited to be at her big brother’s birthday party hanging out with older kids. I meet some more moms; we laugh and talk; I keep an eye on the kids; all seems to be going well. As opposed to what? Sleep on the trampoline? Eat the trampoline? “Um, yeah, it’s ok. My kids and their friends jump on it all the time,” I say. “And the party entertainment will be here any minute, so the kids will be doing that soon anyway. I think it’s all right if some of them are on the trampoline for just a few minutes,” I say cheerfully, biting my tongue. Now I’m second-guessing myself. Should I have forbidden kids on the trampoline? Was it a bad idea to have a backyard party? Someone asks me where the ice chest is, so I hustle over and start handling other party duties. The doorbell rings and the Sports Coaches enter. Tucker is so excited! These are the Coaches who run the after-school sports programs in our district – and you can hire them to entertain the kids at your party with a bunch of different playground games. The Coaches start setting out cones, flags, and a ton of different balls on the sport court. The kids are hopping around, eager to start playing. I glance in Karen’s direction to see if she’s going to grill me on liability insurance waivers in case the kids are injured while playing Capture the Flag. Thankfully, she’s engaged elsewhere – she’s skulking around the perimeter of the yard, no doubt hunting for other hazards – poisonous mushrooms or a perhaps a rusty nail. Meanwhile, Tucker’s grinning from ear to ear, running around the backyard with his classmates and the Coaches. We’re cheering and laughing as the kids play the games. It’s a gorgeous crisp sunny day and I’m really happy everything is going smoothly. I slip into the house to set out the lasagna, pizza, salad, and the rest of lunch, along with some cookies in case someone prefers those to birthday cake. OMIGOD! She is like the Harbinger of Doom! Honestly! “No,” she says, “but other people might be. Some people can die from eating nuts.” She says ever-so-helpfully. “OK, well, all the parents are here, so if one of them has a kid with aFATAL nut allergy, then they probably would have mentioned it by now,” I say, with just a teeny bit of exasperation seeping into my voice. I am trying so hard to remain friendly and cheerful – but I swear to God, every time I turn around today, she’s like the frikkin’ Grim Reaper telling me how everyone at my party is going to die!! I’ve never been so stressed at a party in my life. I stare at her. I march over to the patio, with her trailing quickly behind me. People look at me and shake their heads. Now they look bewildered, but they still shake their heads. And you know what else has nuts? This party. And Nut Numero Uno is Karen. And the only person in danger of meeting her maker at this party is Karen. Have you ever met a parent like Karen? Ever had a party where one guest drove you crazy for a different reason? Share your tales of kids’ birthday parties or infuriating parents or bizarre guests! Or post a comment! Darcy would love to read them! This was originally published on So Then Stories. Darcy Perdu shares short, funny, true stories about well-meaning relatives, exasperating co-workers, rambunctious kids -- and her many bodacious blunders. Come share a funny story at www.SoThenStories.com.